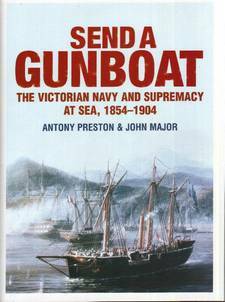 John Preston, who died in 2004, was a highly respected naval historian and this book was originally published in 1967 at the start of his book writing career. Co-authored with John Major, it covers the use of smaller warships as a tool of foreign policy. It is a testament to the research and authorship of the co-authors that this new edition has required few amendments or additions. It is the definitive guide to the subject and a part of Royal Navy history that has received very little coverage. Apart from the Crimean War, which was something of an international sideshow, the period after the Napoleonic Wars until the 1914-18 Great War was one of relative peace. Pax Britannica saw Great Britain at the head of a great Empire that encompassed the world acting as the international policeman. The sending of a gunboat was frequently successful in preventing the outbreak of significant conflict. Great Britain was not alone in employing gunboats in this way and the United States forced Japan to open her ports to US trade by gunboat diplomacy. However, the Royal Navy was THE Navy enjoying global supremacy. In many respects this was the Golden Age of the Royal Navy. Some will argue that fighting capability seriously declined as politicians and the Admiralty failed to invest fully in new technologies to counter potential major enemies, and there is a case to answer that the Royal Navy failed to maintain the Nelson Tradition in big ship fighting capabilities, becoming complacent. However, it was still a period when no other navy considered itself equal and where the advertisement of naval power often avoided the need to use guns. There are parallels in the early Twenty First Century where the United States has been left as the large military supper power but where the lack of a major conflict and the frequency of ‘police actions’ hides the real situation of growing potential risk and a realignment of power groups.